let�s learn English with a nice and easy song! This exercise reveals the actor behind the mask of Dr House. Have fun. 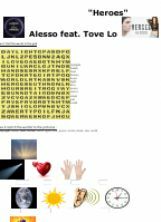 Reading Comprehension (Crossword) about Sesame Street and James Blunt�s parody of his own song �You Are Beautiful� to develop listening skills. A very beautiful song, Music and Me was the third solo album by American singer Michael Jackson, released in 1973 on the Motown label. Songs are great to practice listening, so here you have one more song! Your feedback is always welcome! A student asked me for this song, so here it is!